Listed in: Bedding, Benchers, Candlesticks, Gifts, Jewelry, Ketubah, Kittel, Silver, Tallis and Watch categories. Get more for your wedding! 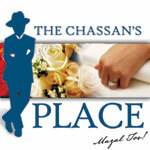 Don't forget to mention ChossonKallah.com when visiting The Chassan's Place.com.